The United Bible Societies (UBS) is a fellowship of 145 national Bible Societies working to place God’s Word in the hearts and minds of the people they serve across 200 countries and territories. The German Bible Society serves as the scholarly publishing centre for UBS. The task of the Institute for New Testament Textual Research (INTF) is to comprehensively document and analyse the history of the textual tradition of the New Testament in its Greek original language. The German Bible Society is the publisher of several editions, developed by INTF. The Society of Biblical Literature is the oldest and largest international scholarly membership organization in the field of biblical studies with over 8,500 international members. 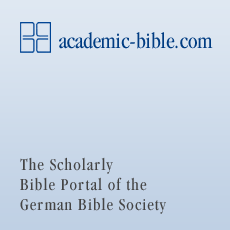 The German Bible Society collaborates with SBL in the development of scholarly editions and tools. The Mission of the American Bible Society is to make the Bible available to every person in a language and format each can understand and afford, so all people may experience its life-changing message. ABS distributes GBS editions in the United States. Hendrickson Publishers has a strong history of producing outstanding academic, trade, and reference books at a reasonable price. The German Bible Society collaborates with Hendrickson in the development of scholarly titles and for the distribution in the United States.